Andrew Wiggins, Gorgui Dieng and Shabazz Muhammad share the distinction of being the only Timberwolves who have played in all 25 games of the 2014-15 season. They also constitute the closest thing this Wolves team has to a young core to build around; at least if you also include Ricky Rubio, who has been out this year with an ankle injury. 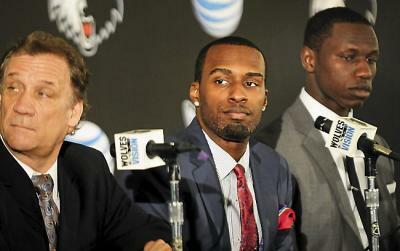 Wiggins is the number one pick with the physical tools, the tantalizing athleticism. For now and the foreseeable future, he’s unequivocally considered the franchise cornerstone. Wiggins is a 19-year old rookie. If he develops like the team hopes, he will almost certainly be a Timberwolf for 7 or 8 more seasons after this one. Gorgui is the interior defender, the rim protector. He’s an efficient scorer who fills out the stat sheet with points, rebounds, assists, steals and blocks. Gorgui works hard and does the dirty work. While his lack of “true center” size is a real issue, Flip Saunders believes that Gorgui is an NBA starter. Turning 25 next month, Dieng is significantly older than Wiggins and Muhammad. However, he is only in his second year of a bargain-level contract. (He earns about $1.4 Million this year, while out-producing some veterans around the league who earn 5 or 10 times more.) Provided his individual defense improves, there’s every reason to believe he will play the prime half-dozen seasons of his career in Minneapolis. Shabazz has been a revelation. He’s quickly becoming a consistent, dominant scorer, as well as a tenacious rebounder from the wing position. On Friday against the Celtics, Shabazz posted his best all-around stat line, with 26 points (11-15 shooting), 5 rebounds and 5 assists. Barely 22 years old, Shabazz is improving at shocking rate, and is becoming one of the best young offensive wing players in the league. Shabazz recently turned 22, and is also in his second year of a cheap deal. If the hot start proves to be sustainable, the Wolves will extend him for 4 more seasons beginning with 2017-18. In other words, he’ll be here for a long, long time. Considering that the Wolves are in clear-cut rebuilding mode, one would assume that this young trio would be logging tons of minutes together, gaining experience and developing chemistry. But, so far anyway, that has not been the case. According to nba.com’s lineup data, the Wiggins-Dieng-Muhammad trio has only played 112 minutes together in 15 games. Basic math tells us that’s just about 7.5 minutes per game for 15 games, and zero time spent together in the other ten. Again, this is not an injury issue, as each player has played in every single game this season. In that time together, this trio is outscored by 3.8 points per 100 possessions. That’s obviously not good compared to the rest of the league, but it is very good compared to other Timberwolves lineups: As a team, the Wolves net rating is (-11.5). The two-man lineup data offers some explanation. Gorgui has played with Wiggins for 438 minutes, and with Muhammad for 289 minutes. But Wiggins and Muhammad, the team’s best two wing players, have only shared the floor for 187 minutes in 18 games. It would be in Flip’s best interests — both as coach of the current team and president of the franchise with a longer view — to change this pattern and begin to develop the chemistry of the team’s best young players by grouping them together during games. In other words, Bradley just thought they played like a team because they played so much together. There are modern examples to look to for similar development. Two seasons ago, Portland had the 5th most used four-man lineup in the NBA. Damian Lillard (a rookie), Wes Matthews, Nicolas Batum and LaMarcus Aldridge played 1426 minutes together. While they played at a respectable level (+48) they were hardly world beaters. Their team ended the season 33-49. But the following year, the same foursome played together a ton, again, (1,555 minutes) and this time they were a (+249) and the Blazers won 54 games and a second-round playoff appearance. This year, the Blazers are 22-6, having beaten the Spurs — the team who smoked them in last year’s playoffs — twice, recently. That four-man lineup remains strong: they are (+116) in 502 minutes, and beating opponents by 11.3 points per 100 possessions. A more cursory look around the league shows similar examples. The guys in Golden State have had some injuries to deal with, but Steph Curry, Klay Thompson, and Andrew Bogut have played a lot together over the past few years. They’ve improved more in bursts than on a linear track — the coaching change from Mark Jackson to Steve Kerr being the most recent spike — but sheer repetition must have been a factor leading them to their current, best-in-the-league status. Before Paul George’s injury and Lance Stephenson’s free agency departure, the Pacers had a similar growth. Without an A1 Superstar offensive player, the Pacers built a league-best defense and came very close to dethroning the Big Three Miami Heat even before LeBron went back to Cleveland. There are others that I’m sure you can think of. The point is, more time together builds chemistry and chemistry builds success. And to this point, the Wolves have not been playing their future core together enough. You just wrote about something that goes through my head during every Wolves game. I just cannot figure out why Shabazz and Wiggins aren’t on the floor together more often. I’m still fan as Bazz as a 6th man. I like Turbo-Bazz who can just go all out when he’s in. Even more critical is playing Bennett with Wiggins/Bazz/Dieng – this becomes even more critical when Rubio returns. Dieng/Bennett/Wiggins/Bazz/LaVine/Rubio – these 6 players will be responsible for 180 or 240 minutes a game going forward. We will still need 50-60 minutes split between C/PF and perhaps Wing/Guard – and another 10 or so to develop new draft choices. Also critical going forward is developing a D-league affiliate – where our youngest players can season for a year or two as our lineup stabilizes.